I bought that set in China from the whole sale supplier. At the moment I was shopping for a good quality bluetooth headphone as I was tired of wired one, which always had tendency to be tied in knots. Trust me...shopping in real electronic supermarket in China is not an easy deal. There are thousands of small booths with different products. Some of them looks the same, some very different. But with the headphones I can assure: looks the same doesn't mean it's the same. In any rate, I got bunch of different and among them the one in the picture. 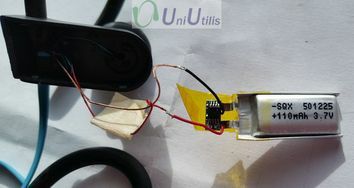 Android device would recognise it as U8 headphone. The sound from it is very nice! 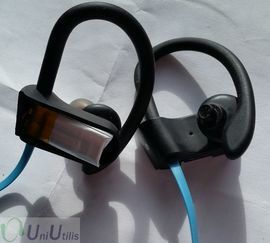 Good base, which is very rare for cheap bluetooth headphone. By the way, it cost something like $8. It would be 2 solid hours on audio listening and on medium level loudness. Very comfortable and won't fall off the ear. I really liked that rubber hook over the ear, which kept that headphone from falling off. It charged by a regular micro-usb cable, which is used in present days by majority cell phones. The picture above has an open back cover. Let me explain why. I didn't used it for less then 2 months. Before that, it was fully charged. I tried to turn on and it was dead. Plugged in a charger and no sign of life ether. I kind of knew what did happened. Those small devises doesn't like to be left alone. They want to be constantly charged. I opened it completely, both sides (left and right). The right side (with all the buttons and USB connector) was for electronics only and the left was for battery. Measuring battery voltage shows 0V. But it was an easy deal because it had PCM or BMS board, which protects battery from under-discharge. It is good and bad. Good because it does not let the device continue to use battery below 3V. Bad because the protection will continue using battery beyond 3V, which in 3-4 months on small batteries lead to 0 volts level. After that battery is junk. 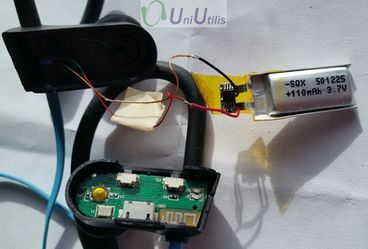 I charged it a little bit, by unwrapping the PCM module from the battery lip and after that connected the regular USB charger. And miracle! Headphone is back to life! This trick is only good with some cases. Main thing is the time. If battery is dead (0 vols) for long time, it won't revive. My next step to find out how good is the battery. I took it to my battery tester and it came with 117mAh. Not so bad for 110mA written on the battery. So battery is good quality. This means the whole Bluetooth device is good too. You might wonder about that no power failure. I've seen that with 99% Chinese Bluetooth devises. Even with the best of the best. The only way to avoid it if you have a mechanical switch or extremely high qualiy electronic devises, which using state of the art semiconductor microcontrollers or battery management systems. For $8...10 it won't be the case. Otherwise the manufacturer won't make any profit. Conclusion: Not Bad, and in fact Very Good for small price.